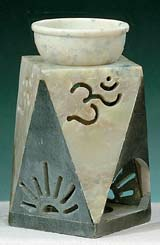 Home > Health & Beauty > Aromatherapy > Soap Stone Oil Diffuser 5"
Standing 5" tall and 4" wide, this soapstone diffuser is intricately carved in beautiful designs. Easy to clean, this diffuser uses only a tealight candle to heat the oil and release its scent about the room. * Because of the handmade quality of the Soapstone Oil Diffuser, colors and window carving design may differ from above image.